Color/Appearance: There is a fair degree of color variation between boards of Santos Mahogany, ranging from a lighter golden brown to a darker purplish red or burgundy. The color tends to turn more red/purple with age. 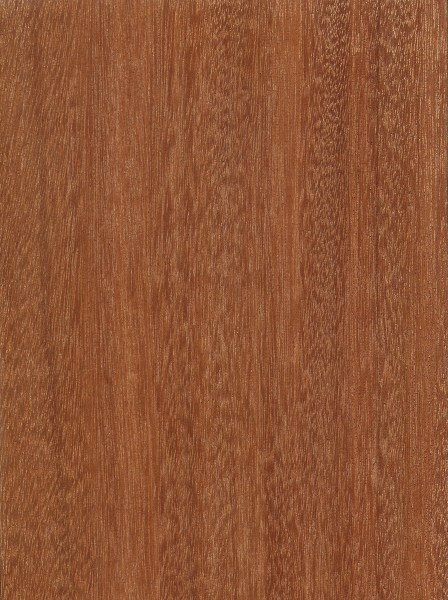 Quartersawn sections can show a striped or ribbon pattern. 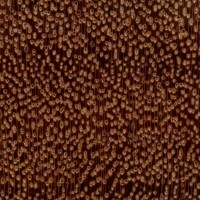 Grain/Texture: Grain is usually interlocked, with a medium to fine texture. Good natural luster. 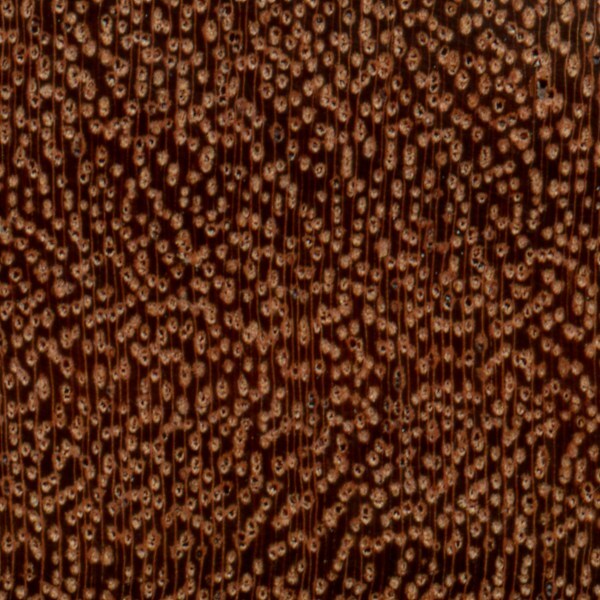 Endgrain: Diffuse-porous; large pores in no specific arrangement, few; commonly in radial multiples of 2-3; reddish brown heartwood deposits common; growth rings usually indistinct, sometimes distinct due to discontinuous bands of marginal parenchyma; narrow rays not visible without lens, normal to fairly close spacing; parenchyma vasicentric and confluent. Rot Resistance: Rated as very durable in regards to decay resistance, with mixed reports on susceptibility to insect attack. 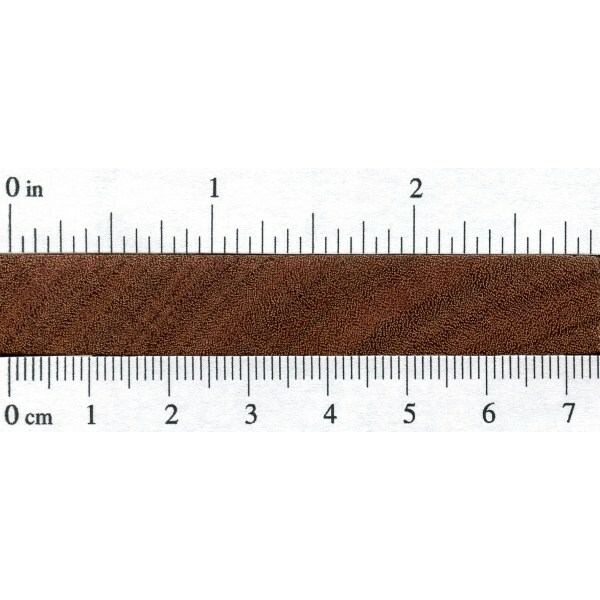 Workability: Santos Mahogany has a noticeable blunting effect on cutting edges. Working characteristics are rated as fair to poor, on account of both its density and its interlocked grain. Staining or gluing can sometimes be problematic, though the wood finishes well. 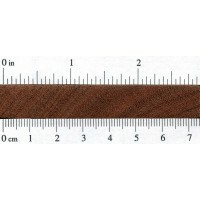 Odor: Santos Mahogany has a very distinctive spicy scent when being worked. 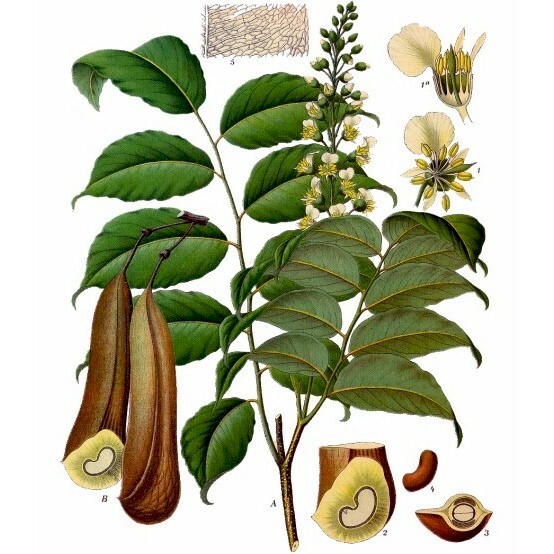 Trees from the Myroxylon genus are used to make Balsam of Peru, an ingredient used in perfumes. Allergies/Toxicity: Although severe reactions are quite uncommon, Santos Mahogany has been reported to cause skin and respiratory irritation. See the articles Wood Allergies and Toxicity and Wood Dust Safety for more information. Pricing/Availability: Should be in the mid-range for an imported timber; comparing similarly to other exotic hardwoods used in flooring, such as Ipe. Common Uses: Flooring, furniture, interior trim, and heavy construction. Comments: Despite its name, Santos Mahogany is not really related to true Mahogany (Swietenia genus), nor is it even in the Meliaceae family, as is the case with African Mahogany (Khaya genus) and Spanish Cedar (Cedrela odorata). 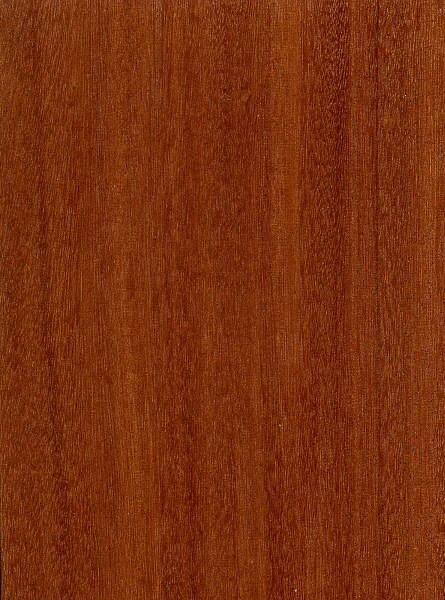 Santos Mahogany can have a Mahogany-like appearance, though it is typically much denser, harder, and stronger than true Mahogany—and also much more difficult to work. 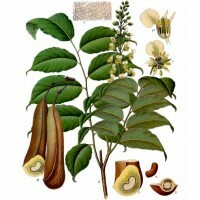 Santos Mahogany trees, sometimes called Balsamo, are used in the production of the substance called Balsam of Peru, used as a fragrance in perfumes. Hi, I am slightly allergic to Balsam of Peru. Will it cause any allergic reaction if I live in a house with Santos Mahogany wood floors? Thanks. Assuming someone were so inclined, would this wood be too dense to serve as a canoe paddle? Being 90% as dense as water, I can imagine a pregnant pause if it were dropped overboard, at least until it popped back up to the surface.